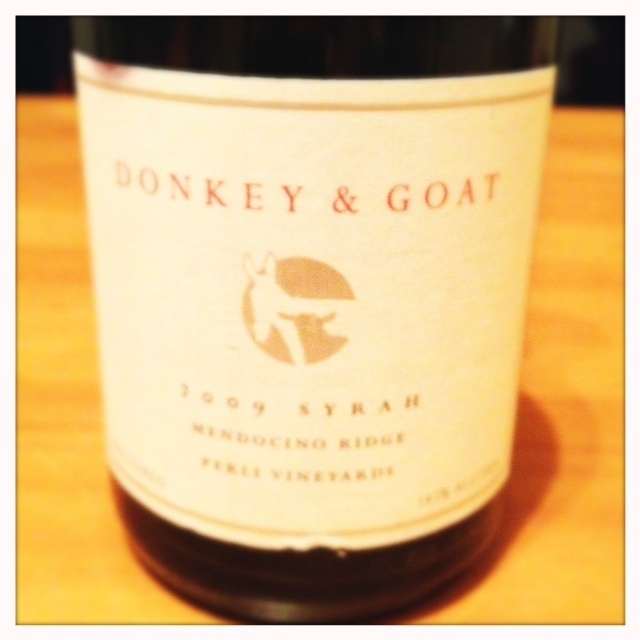 Just like the town that they are located in, Donkey and Goat Winery in Berkeley, California inspires some strong opinions. Jared and Tracey Brandt believe in making natural wine with minimal intervention, resulting in wines that can frankly be stranger than anything you’ve probably ever tasted in California. I’ve heard their wines referred to as being gimmicky and overpriced, just plain weird (that comment comes from my wife after she tasted one of their white wines), and I’ve also heard of them referred to as transcendent. So, what is it about Donkey and Goat that causes these types of reactions? The Brandts got their start at Crushpad when it was in San Francisco. For them, making natural wine means that their wines have no added yeasts, and they let their wines ferment with whatever yeasts blow in on the surrounding Berkeley winds. The wines are crushed by foot and are left unfined and unfiltered because the Brandts don’t believe in compromising flavor and aroma for smoothness. This is a decidedly different approach than what most wineries in California take, and their white wines especially are often packed with sediment and have a strange unsettled color. The wines are crushed by foot and often include a substantial amount of whole cluster. And at no point do their wines get held in plastic during winemaking. The Brandts are also self-admittedly crazy about adding the least amount of sulfite possible to stabilize the wine. Suffice to say, they are minimalists in the extreme. In fact, on the home page of their website, they proudly state: No plastics, no stabilization, little (to no) sulfur, no new oak, no machines for crushing. They are proudly waving the natural wine flag. The wine: Now, I’ll admit that even though I eventually loved this wine, on the first sniff this wine gave me a sort of strange yeasty-grapefruit aroma. The aroma took me right back to having tasted Donkey and Goat’s Rousanne that had this same interesting grapefruit aroma. It worked in the white wine but getting this same aroma in their Syrah was off-putting. Luckily it blew off within a little while. After the wine opened up, it began to smell and taste more authentically of pure, unadulterated, true Syrah. The absolute lack of oak or alcohol aromas allows the true Syrah characteristics to shine — natural floral and salty, black olive aromas. There’s also some wonderful ripe plum, black licorice, and strawberry aromas to juxtapose the black olive. On the palate it’s enjoyably rustic and has real texture to it. Too many California wines can be obsessed with smoothness, which is a descriptor I would definitely not use for this wine. But it’s “not smooth” in a good way — it’s a wine that dances on the tongue, it has more complexity and sort of a density to it that I don’t get in wines that have been filtered. It’s got some blackberry on the finish and some earthy-gravel notes with just the right amount of acidity. The tannins definitely come through and it could benefit from a few more years of bottling. However, with some air it’s approachable now and those same salty olive flavors come through, making me crave roasted or grilled meat with herbed potatoes. Even though I haven’t exactly been wowed by the natural wine movement, I love this wine. It’s a wine that shows that the natural process of making wine can be beneficial for letting the true flavors of the vineyard come through in pure, unadulterated, textured deliciousness. This is now the fourth Syrah I’ve had from Yorkville Highlands and I’m beginning to develop a sense of what that region is capable of. The Yorkville Syrahs I’ve had are a tad richer and a tad bigger than the extreme cool-climate Syrahs I’ve tasted. It’s fun to taste a series of wines from a specific appellation and develop a sense of the terroir. The Yorkville Highlands is a small appellation situated between the heat of the interior Alexander Valley and the cool, almost coastal climate of the Anderson Valley. The climate is really a mix of both the aforementioned appellations–it gets some of the heat of the Alexander Valley, and the fog of the Anderson Valley. There are vineyards planted with everything from Cabernet to Pinot Noir. Consequently, it’s an appellation that ever since its inception in 1998 has been trying to figure out what its signature variety is going to be. The first wines that I tasted from Yorkville Highlands were Bordeaux varieties from a little winery called Yorkville Cellars. These were not your typical rich Napa Bordeaux-style wines. They were higher in acid, depicting their cool origins. They were good wines, but because of their higher acidity, they’ve always seemed like a tough sell in a state known for just the opposite. This wine has a striking blackberry aroma mixed with a bit of vanilla. I’m not getting as many of the savory elements that I normally enjoy in a cool-climate and it’s a richer, darker, and more supple style. There is a floral component and there’s also a fair amount of minerality here. But, where this wine really screams cool climate is on the palate. Yes, it’s rich and full but it’s also got such a nice lift of acidity on the finish that it makes me think the wine would go great with food. It’s extremely well balanced and the alcohol doesn’t come through at all. 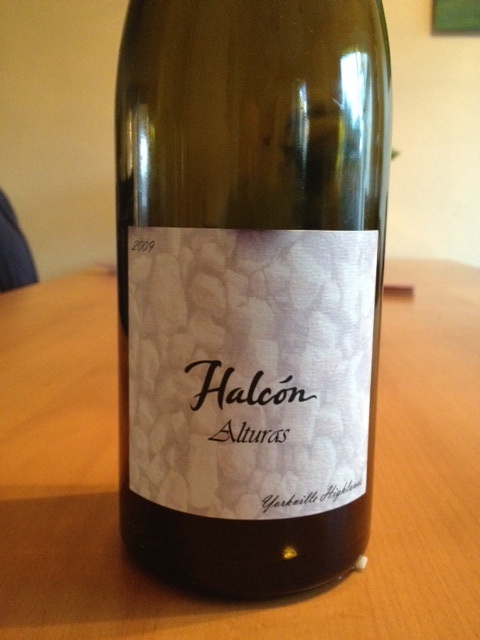 The Halcón Alturas Syrah is 100% Syrah and was made with minimal intervention techniques, native yeasts, and no added acid. It’s a wine that truly does represent the terroir that it was grown in, and is a successful combination of a cool climate and warm climate Syrah. It has the acidity and food-friendliness of a cool climate wine but the suppleness and deliciousness of a warmer climate wine, and I think it would be perfect for somebody new to cool-climate Syrah. It has that delicious factor that could bring people into the Syrah fold. Could it be that the future of the Yorkville Highlands is to create Syrah that is popular because of its richness, yet also representative of true Syrah because of its higher acidity? This wine has converted me into a believer of Syrah grown in the Yorkville Highlands. Copain and Meyer Family Cellars also make delicious Syrah from this region. As the vines grow older I can only hope that they are going to get better and better and the region could really become a sweet spot for Syrah. Hmm, did I just convince myself to buy some land there and plant it with Syrah? Wine people often talk about their epiphany wine, the one wine that really got them into wine and made them realize how elevating wine can be — the wine that started an obsession or at least began a lifelong passion. I’ve always had trouble with this question since there are so many wines that made me realize how much I love wine and how much I want it to be a part of my life. I’ve had epiphany white wines, epiphany red wines, and even epiphany $10 wines. For me, context is everything and therefore it’s hard to pick one wine that started it all. That being said, as evidenced by this blog, I have developed perhaps an unhealthy (at least on my teacher’s salary) obsession with New World cool-climate Syrahs. 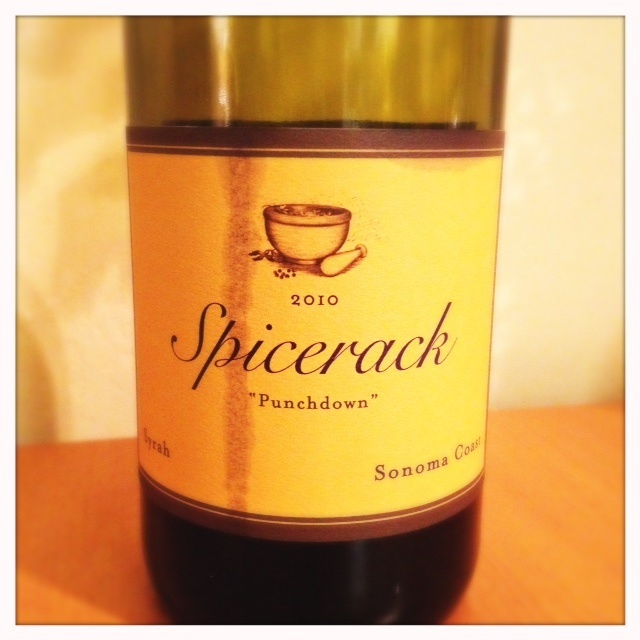 And, if I had to name one wine that started that obsession, then it would be the Spicerack “Punchdown” Syrah. It was the wine that I bought by chance a few years back and was immediately blown away by how refined and well made the wine was. It was a wine that delivered a perfect balance between acidity and fruit. It was a wine that had the savory elements that I had begun to look for at that time but all couched in delicious pure fruit. And, possibly most importantly, it was a wine that delivered all of that deliciousness for only about $20. I wish I could remember what vintage it was but I think it was a 2006. The Spicerack was one of the first Californian wines that I’d had that, because of its tannins and acidity, seemed age-able to me. This was the wine that even momentarily got me excited about attempting to convince a friend of mine who had just inherited a large chunk of money to buy up a bunch of Sonoma Coast Syrah and store it in order to re-sell later when the price went up. Full disclosure: I had just read a Jon Bonné article in The Chronicle that convinced me that cool-climate Syrah would be the next big thing. Luckily, a friend who knew a lot more about wine than I did at that time told me that the market for collectable cult wine in California was effectively losing its momentum, and even if it was possible to buy now to make money later, it certainly wasn’t going to happen by buying Syrah. Which, of course, is exactly how things played out. I bought a few bottles of the Spicerack and occasionally kept my eye out for subsequent vintages at K and L but was never able to find it and at that time I was a little too lazy and poor to actually join a mailing list and pay the extra shipping costs. So it was such a pleasure and a bit of a surprise to see the Spicerack turn up recently at one of my local markets. I’m not exactly sure why this vintage showed up again, but I’m guessing it had something to do with how much Syrah they made for this particular vintage. Like many California wineries, Pey-Marin is interested in selling most of their wine via its mailing list and avoiding retailers as much as it can. It’s possible that they made more wine in 2010 than it had in previous vintages, or maybe it just didn’t sell to the mailing list as they anticipated. Whatever the reason, a bunch of the Spicerack hit the market at roughly the same time. There it was again at K and L, and there it was again at my local upscale Draeger’s market and even on WinesTilSoldOut.com. The Spicerack Syrah is a delicious wine, its got all of those delicious cool-climate flavors and aromas that I love so much. There’s a tiny bit more oak than I’m used to and also a dark chocolate aroma which is usually a sign that the wine is a warmer climate style but all of that is wrapped up in white pepper, plum, black olive, and gravel. It’s also crunchy, and I know that’s not the world’s best adjective but drinking this wine really feels like you’re crunching into an apple or better yet, a pomegranate. In fact, that’s exactly what this wine tastes like to me on the mid-palate — a delicious pomegranate. The finish also has a nice tannic punch and a very dry feeling. As the wine opens up it develops a little more richness, and the tannins round out and the mid-palate gains some structure. All in all, this is still a very impressive wine. It’s reminiscent of the previous vintage I had but not having taken any tasting notes on the 2006 prevents me from making any precise comparisons. The Spicerack “Punchdown” is made with no stem inclusion and the wine goes through many punchdowns (yes, that’s how it got its name). I’ll get further in to Syrah’s many wine-making permutations in another post. For now, I’ll say that the stem-inclusion question with cool-climate Syrah is a controversial one. Some would say that leaving the stems out makes the wine less interesting. I can vouch that the Spicerack and the Peay are interesting wines, and they are de-stemmed before they go through fermentation. The grapes for this wine come from well-known cool-climate Syrah sites (please check out this map I’ve made), Rodger’s Creek, Wildcat Mountain, and Shanel vineyards). There’s also a bit of Grenache in this wine, which the winemakers believe bring the wine together. It was a pleasure to revisit the Spicerack “Punchdown” and I’ll definitely be getting the subsequent vintages. This time, I’ll be first in line.